Thanks to the generous funding of the John D. and Catherine T. MacArthur Foundation, this is the project’s eight annual study on organized crime and violence in Mexico. As in previous years, this report compiles the latest available data and analysis to evaluate trends related to drug trafficking and organized crime in Mexico. This year’s report builds on past findings and seeks to provide new insights into Mexico’s recent security situation. The authors find that after a decline in 2012-2014, homicides began to rise again in 2015 and jumped 20% in 2016, and the worsening of security conditions over the past two years has been a major setback for President Enrique Peña Nieto (2012-2018), who pledged to reduce violence dramatically during his administration. 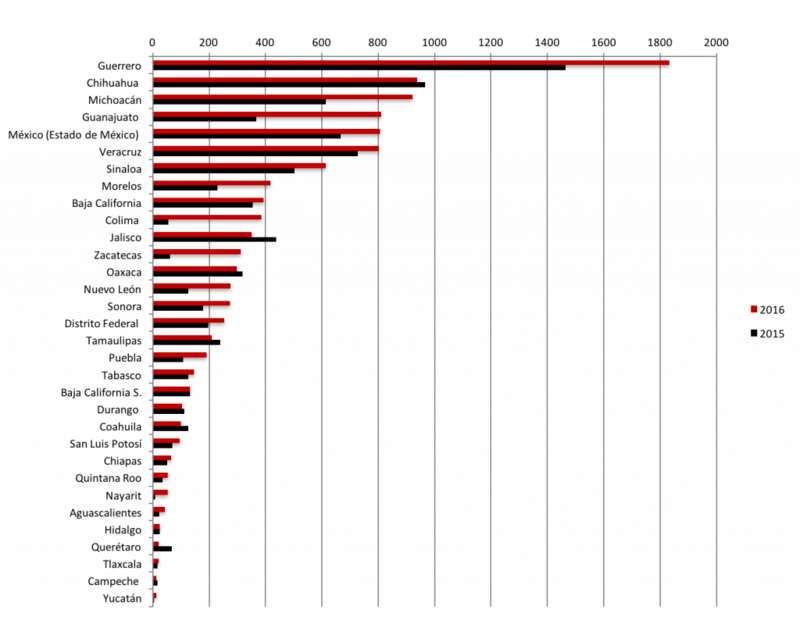 Notably, the largest increases were registered in Colima with a 600% increase from 2015 to 2016, Nayarit (500% increase), and Zacatecas (405% increase), all of which have an important role in drug production or trafficking and are contested by rival organized crime groups. Meanwhile, several states registered noticeable decreases, including Querétaro with a 69% decrease in intentional homicides and Campeche with a 24% decrease. Authors also found that “El Chapo” Guzmán’s arrest and extradition appear to be partly fueling violence. 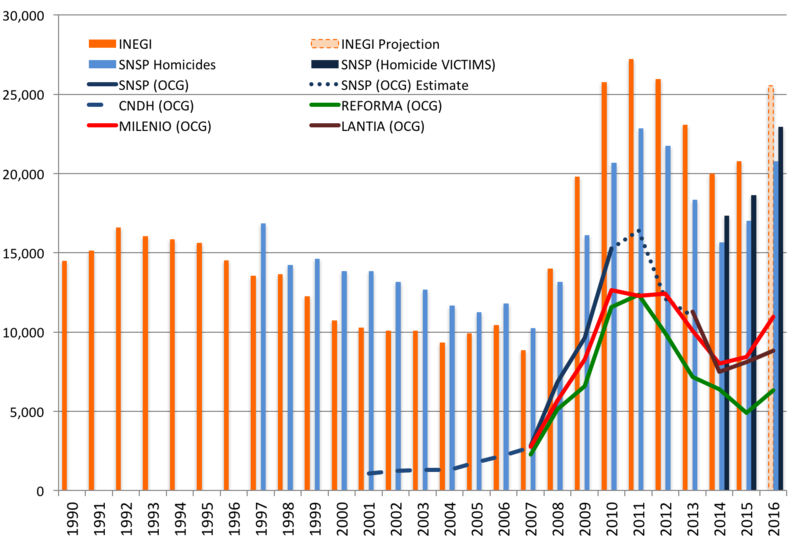 What is particularly concerning about Mexico’s sudden increases in homicides in recent years is that much or most of this elevated violence appears to be attributable to “organized crime” groups, particularly those involved in drug trafficking. 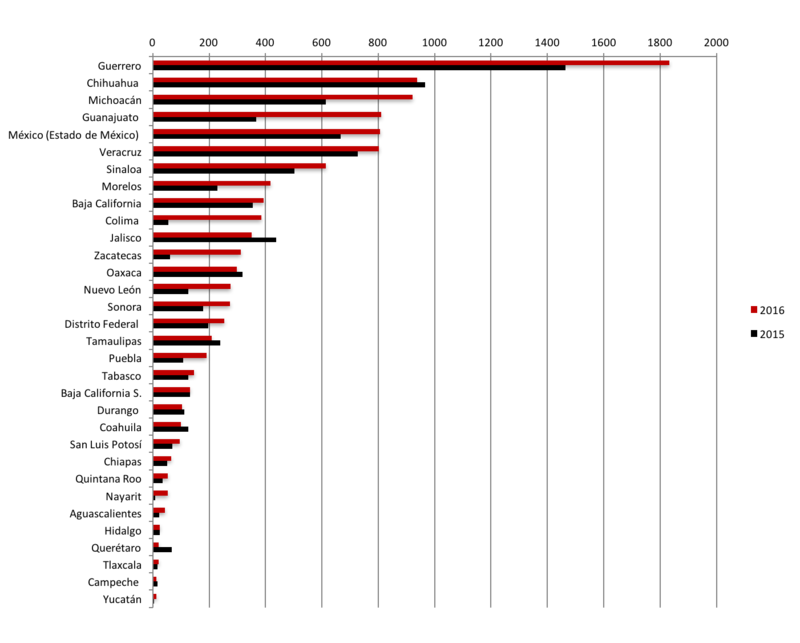 While there are important methodological problems with compiling data on organized crime-related killings, tallies produced over the past decade by government, media, academic, NGO, and consulting organizations suggest that roughly a third to half of all homicides in Mexico bear signs of organized crime-style violence, including the use of high-caliber automatic weapons, torture, dismemberment, and explicit messages involving organized-crime groups. In 2016, there was greater disparity in the estimated number of organized crime-style killings documented by some sources (6,325 according to Reforma newspaper and 10,967 according to Milenio), but the proportion of total homicides was at least 25% and perhaps greater than 40%. The analysis in this report suggests that a significant portion of Mexico’s increases in violence in 2015 and 2016 were related to inter- and intra-organizational conflicts among rival drug traffickers in the wake of Guzmán’s re-arrest in 2016. Authors believe that, as the U.S. President Donald Trump wants to push the Mexican government to reinvigorate its counter-narcotics efforts and also work to increase U.S. security measures along the 2,000 mile Southwest border, tensions between the two countries could undermine the close law enforcement and security cooperation achieved under the administrations of presidents George W. Bush (2000-2008) and Barack Obama (2008-2016). 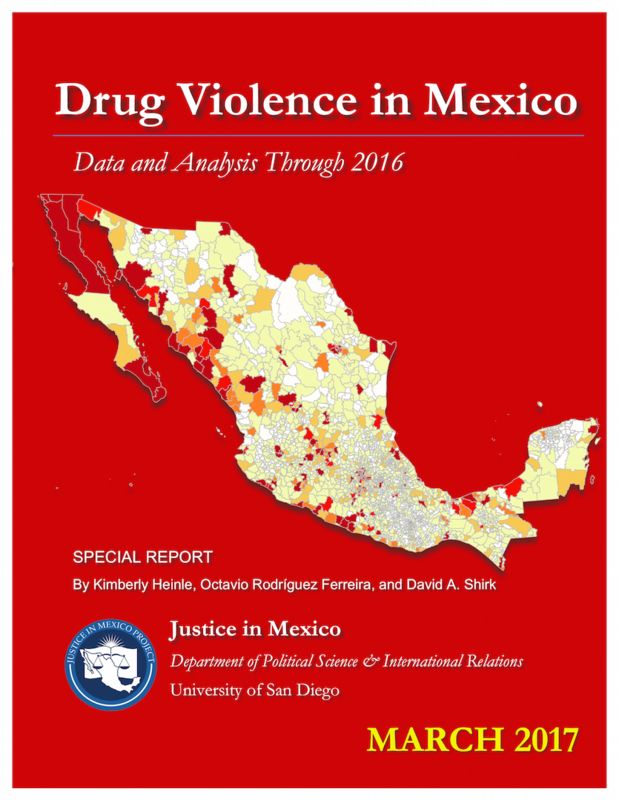 “Drug Violence in Mexico: Data and Analysis Through 2016” was co-authored by Kimberly Heinle, Octavio Rodríguez Ferreira, and David A. Shirk. This entry was posted in Crime and Violence, Publications, Special Reports and tagged Drug Violence, Mexico. Bookmark the permalink.